In response to a small spat that happened amongst two commentators yesterday, I want to stress that the Barts-MS blog is not a general purpose information resource for people with MS. Our brief is to ‘interpret good, bad and other research news’. We do provide information about how we at Barts-MS manage MS, but please note this information may be at odds with advice you have been given, your own MS centre’s practice, or advice from other healthcare professionals. You have to realise that the information provided by the MS charities has to be ‘evidence-based’ and if not evidence-based derived by ‘consensus’. Consensus refers to ‘generally accepted opinion or decision among a group of people’. If you want a consensus opinion this blog is not the place you should come to for guidance. 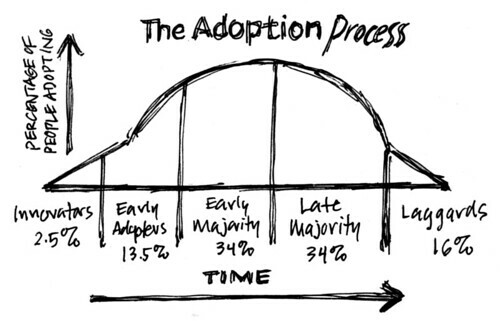 Consensus is typically reached when adoption of a process has reached the late majority, in other words it is behind the peak of the curve. 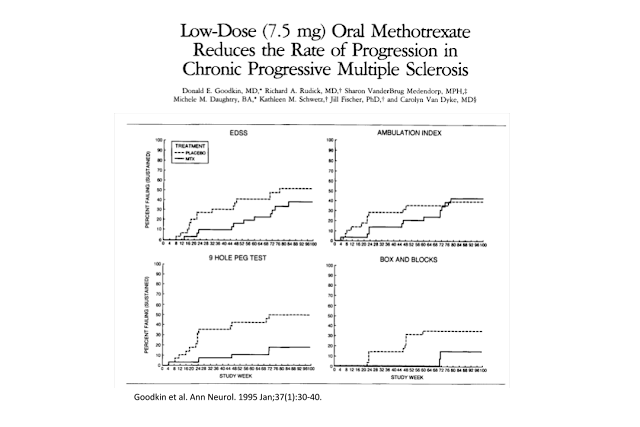 In relation to the debate on low-dose oral methotrexate (LDOM) as a treatment for MS. Our position is that there is class 1 evidence that has shown an effect of LDOM in delaying worsening of upper limb disability in chronic progressive MS over a period of 2-years. Although this trial did not show an effect on lower limb disability it was too short, based on therapeutic lag, to show an effect on mobility. As this is only one study you need to be aware that it could be a false positive result and hence in an ideal world we would want a second study. However, based on this trial a large number of neurologists, particularly in the USA, prescribe LDOM for their patients with more advanced MS. In general, at Barts-MS we don’t use LDOM. We prefer to use off-label cladribine because it has a better safety profile, it is easier to use, their is less monitoring requirements and it has the potential advantage of penetrating the CNS. Cladribine is also supported by a much larger evidence-base from relapsing MS. However, we would only use cladribine in patients with more advanced MS is there was evidence of active disease, i.e. new or enlarging T2 lesions on serial MRI, Gd-enhancing lesions on single current MRI and/or raised spinal fluid neurofilament levels. So the question remains is what do you think I should do with the following patient? The current consensus view would be watchful waiting until a treatment for PPMS is licensed, and covered by the NHS. I only come to this site because it is ahead of the curve. By reading the posts on this site I know more than my neurologist about what is going on in the field. So ProfG, the current consensus view is watch and wait but is that your opinion? Or, are you going to offer him cladribine (assuming the gent hasn't already precluded that himself)? He seems a perfect fit for the Barts off-label clad programme and in his position, I would go for it. If I may say so – I find that the UK MS Trust take _all_ evidence into consideration, also the more tenuous, cutting edge stuff. They certainly did in their answers to my questions. But – and this is vital – they also include side-effect information and respect the fact that not everyone wishes to go for high risk treatment or treatment which may or may not work. They are cutting edge, but well-rounded. I cannot praise them highly enough. What they say on their car stickers is certainly true: "Making sure no one has to deal with MS alone." I know I'm preaching to the converted here, but they have taken massive burdens of bewilderment and anxiety away from me. They are indespensible and wonderful. The problem I have with your article is that it presumes that all eventually adopted treatments are effective. In many cases, the "laggards" are actually those who are refusing to prescribe ineffective unproven treatments. The history of medicine is filled with commonly used but ineffective treatments (cardiac catheterization for stable angina for example). In progressive MS treatment, we are particularly guilty of prescribing treatments which have no evidence or are proven to be ineffective or marginally effective. As you describe yourself, there is a good chance that ocrelizumab is ineffective in older patients with long-standing non-relapsing progressive multiple sclerosis without MRI activity. Should we prescribe medications which are very expensive and have significant safety concerns just to appease our psychological need to "do something" or "be aggressive?" It's all fun and games until someone gets a side effect or we deplete our limited resources so that we are unable to provide proven effective therapies to our patients. The next time you want to prescribe natalizumab to patient with early active RRMS and get denied by the NHS, who are you going to complain to? Just because you are not taking a well-marketed pharmaceutical does not mean you are "doing nothing." Some alternative treatments could include high dose biotin, exercises regimens, nutrient dense diets, and symptomatic pharmaceutical treatments. For the sake of the integrity of our profession, I think it is very important that we be honest and straight-forward about what we can and what we cannot achieve. Our treatment of chronic progressive multiple sclerosis is currently lacking, and we are in need of a revolution. I would normally simply agree with what you have written here, as a pwppms. I say to myself quite a lot – just be at peace, there is nothing to be done, look the truth in the eye. And I get on with loving life and being "brave", both for myself and my loved ones. Then I told myself to pull myself together and stop being such a coward. And I thought of the excellent "Think Hand" campaign, which may result in something being found and proven to really help people like me. And no longer will we be going to neurologists who all too readily dismiss us as hopeless cases, or a waste of resources. Are there any other trials showing the same effect of MTX? Because if there are, why isn't cheap and cheerful MTX used in progressive MS? Or was this a fluke study that nobody managed to replicate? But talking about the case exposed: why not risk medicating he with Cladribine, or maybe a Alemtuzumab, but Cladribine would be a good option. He doesn't have time to wait for Ocrelizumabe to be licensed. I come to the blog to really inform me, keep up to date on what Science knows so far about what I have, because even as I do treatment through SUS I have a medication protocol to follow, so unless I am " Willing "to pay and find a neurologist" willing "to prescribe a drug outside the protocol of the SUS has no way to self medicate" radically. " But talking about the case exposed: why not risk medicating it with Cladribine, or maybe a Alemtuzumabe, but Cladribine would be a good option. He does not have time to wait for Ocrelizumabe to be licensed. I know some people with NMO who use Metotrexate, for some the relapses secure, for others not. Its a no brainier (no pun intended :-)). Do what you can to help the man. The patient sounds informed. Doing nothing will see the man go downhill for sure. Another life devastated by the disease. I have to smile at the term "watchful waiting". What does that look like exactly? From what I read this seems to equate to brief yearly consultations (if lucky). You watch, assess, wait, watch, assess, wait and keep doing this until a licensed treatment emerges for treating PPMS. Some called this 'best supportive care'.